Beltane: Bonfires and May Poles, Oh My! Beltane is celebrated on May 1st or at moonrise on April 30th. This Sabbat marks the halfway point between the spring equinox and the summer solstice. Almost everything about this holiday is debated and/or shrouded in mystery. Every source I turned to has a different story regarding its origins as well as different ways of celebrating it. Instead of regurgitating what is already written elsewhere, I’d like to explore a few traditions surrounding Beltane and their possible ties to Christianity. Bonfires — The word “Beltane” is named for the Celtic sun god Bel or Belenus which means “Bright One.” The name may also stretch way back to the Canaanite fertility god Baal who is mentioned in the Bible. 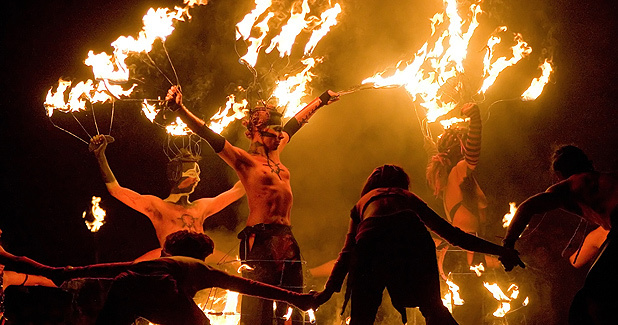 Whatever the case may be, fire is involved in many Beltane celebrations, both old and new. Ancient Druids lit two bonfires while chants and spells were performed. Both cattle and people passed between these two bonfires in order to ensure health and protection in the coming year. People also leaped over the flames for the same reason. Household fires were also extinguished at Beltane and villagers would relight them with embers from the Beltane bonfires. While it may be stretching things a bit, the Christian celebration of Pentecost occurs 50 days after Easter. It celebrates the “tongues of fire” that rested on the disciples when they received the gift of the Holy Spirit. It is usually an exuberant, creative celebration in Christian churches and, depending on the date of Easter, falls close to the celebration of Beltane. This could be coincidental but I find the thematic tie between these two holy days quite interesting. Fertility — Beltane is all about fertility in terms of crops, livestock, and human beings While some still celebrate the lusty spirit of this Sabbat, others focus on the fertility of creativity, work, ideas, and love in all of its forms. May Poles eventually became incorporated into this holy day and people have danced around them, both Pagan and Christian. It is a not so veiled phallic symbol. Perhaps a weak attempt at a Christian alternative to this fertility rituals was Roodmass, which is also known as Holy Cross Day. It was celebrated on May 1st and commemorates the finding of the “true cross” of Jesus by Saint Helena in 355. However, the observance of this holy day never gained much momentum but this is understandable. Let’s be honest, a somber worship service could never compete with the joyous, exuberant celebration of Beltane! Water — It was believed that the dew collected early on Beltane morning possessed magical powers. This was especially true among the Druids. They would use it for anointing and purification rites and believed it promoted health and good fortune. Holy wells were also visited during the festival, and it was believed that first water drawn from a well on Beltane was also powerful. Christians also have a strong connection to water through the rite of baptism. In liturgical churches it is believed that the waters of baptism are symbolic of our being cleansed from sin and rising from death to a new life in Christ. It connects us to the Divine in a powerful, life-changing way. As a final note, my celebration of Beltane includes a reflection of Jesus’ parable of the Sower (Matthew 13:1-9, Mark 4:1-9, Luke 8:4-8) where seeds fall on four different types of soil. The seeds that fall on good soil produce a harvest that is 30, 60, or 100 times greater than what would be expected. This reminds us that the holy seeds of intention we plant in our lives do not always grow into healthy plants. However, when they fall into the Eternal One’s fertile soil, a spectacular harvest is guaranteed. As I bring my thoughts to a close, I hope you have a wonderful Beltane no matter how celebrate it. Life is a beautiful and holy gift that is well worth celebrating with all the gusto we can muster! Happy Beltane, everyone! This entry was posted in Beltane, Pentecost, Wheel of the Year and tagged Beltane, bonfire, Christian, may pole, Pagan, Spirituality, Wicca. Bookmark the permalink. 1 Response to Beltane: Bonfires and May Poles, Oh My! “Without Aries there would be no seeds; without Taurus there would be no gardens” (http://www.astro.com/astrology/in_dg_taurus_e.htm).